My name is Open, which is more a way of being than a name. I bridge into, and work with, higher dimensions of consciousness. I say this without arrogance, pride or ego. It just is. Of course you may not believe me (and that's entirely your prerogative). I say it, so you know, what I claim to be, the source of this sharing. I suggest you take only that which resonates. Find your own truth in what I'm saying. I claim what I'm about to share, is known by those in the higher densities who are working tirelessly and selflessly to facilitate the shift. It's clear there is much confusion, misinformation and even deception going on here. Hence the need for a clear message. But of course I only offer a clear perspective to the degree that my own lens is clear. We can only ever offer a perspective, not the 'absolute truth'. I believe this message is available for all. Although it is not expected nor even necessary that all will embrace it. Clearly, the way events currently proceed here, the majority speed to the precipice of their own oblivion. That is indeed deeply saddening. However, there's no need to allow this unconsciousness to drag the rest of the planet down with it. Certainly not. There is an abundance of evolving, ascending life that is greatly looking forwards to the new 5D harmony in the New Paradigm. For the future of the new existence to be secured, I believe a collapse mechanism of the old reality now needs to take place and indeed, has already begun. Why is this collapse necessary? I see that the new reality will form around the cleansed and condensed foundation stone of the old. If that foundation were still to be cancerous - as it currently is - then it might risk the entirety of the New Paradigm in the higher densities. Even though at a higher frequency of being, Gaia would still be influenced by her consciousness in the lower realm. So as the Hopi accurately prophecised it, a "Great Cleansing" must now happen. It is known in the higher realms as a Great Realignment. She feels the criss-crossing - mind confusing - energy matrix of the society in which humanity lives. She feels every tortured expression of this, as a cell within her own body. And she needs to begin to transmute that pain - to release the energy contained within this lower density - to start to 'compost' this material nightmare that violates and infects everyone. How will that likely happen? The collapse mechanism of the old reality has already begun. 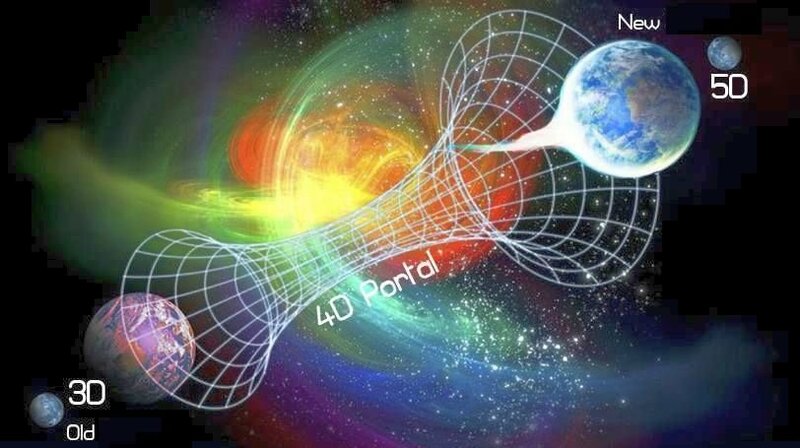 The Intervention that has taken place here, was an interwoven bundle of energetic frequencies instigated from the Fourth Density, which had ensnared the whole of life here. Even those reincarnating were being stripped of their former memories. The first task of benevolence was to unwind those strands of energy so that they could be peeled off one by one. That way, the transition here would be smoother and more readily manageable. The 4D layer of this current karmic construct is now being broken down and will progressively be peeled away over several decades. As it does so, the intervention within it will either be realigned or peeled away from the Earth with that layer. It leaves the Third Density 'matrix', based on the level of the intellect, in which the majority of humanity still appears to be willing enslaved. These deep-seated, conditioned, unjust, inequitable and inhumane behaviours are proving very difficult to break. But they have no place on 5D Earth. Paradoxically, the sense of lack within humanity that craves greater security and therefore controls the resources of the planet, is the very trip switch sparking the breakdown mechanism. Fortunately, there is indeed a wave of human souls who are understanding the sense of urgency, who are reconnecting with the Source and indeed are embarking on this next necessary shift. Thus Gaia, who has so far been waiting for human souls to join the movement, is now ready to begin this next phase. I believe, over time, she will begin to break down the surface of this reality through increasingly wild weather systems, drought, storm, earthquake and volcanic action. Meanwhile her biomagnetic field will dwindle, at a time when solar storm activity is increasing. Ultimately, I see the composition of the atmosphere transforming with cleansing solar storm activity. I have seen the Earth becoming a crucible of fiery change. Clearly, no sophisticated life would be able to survive such radical transformation in this density - the 3D. All reality constructs are created from karma: where there's a requirement - a yearning - for souls to evolve beyond a previous limitation. On Earth, such a construct has been formed in the 4D field, to which souls have been drawn for mutual learning - the challenge is to see past the veil. Gaia too has required this 4D construct - but now no longer. As it peels away from the earth, the old reality will fall away as she ascends her consciousness from the 3D into the 5D, creating a new reality for new explorations, evolution, and growth here. The challenge - and the opportunity - for all life on the planet, is to move through the departing 4D veil, and join her in the 5D New Paradigm. As life passes on, the old karmic layer which shaped this former reality, will be uprooted from the lower densities, and shifted through timespace, into the galactic core, to be fragmented into consciousness 'elementals' - from which, in time, new physical realities will take shape once more, elsewhere in the cosmos. This is what happens in a black hole: it is like a vast, multidimensional, cosmic 'washing machine'; it breaks density down into its constituent quanta of consciousness, before emitting the light out of the other side of this galactic doorway - something that leading comsologists like Stephen Hawking have speculated upon. The Mayans accurately described the supermassive black hole at the centre of our galaxy way before modern science discovered it. They saw the influence of the galactic core, at key times, greatly affecting the psyche. They considered passage along this 'dark road' or "Xibalba be", into the 'underworld', a time of expanded consciousness, by confrontation of ones deepest fears. Personally I have once experienced the sense of my soul being drawn through the galactic core - a terrifying and shattering experience, but also one of incredible liberation, expansion, deep peace and rejuvenation, providing that is, the soul is able let go through it. I'm not saying the physical aspect of Earth will go that way (not any time soon!). What I'm saying is that the fragmenting, dissolving 4D karmic layer will; that which has formed the blueprint - and the anchor - of the old physical 3D reality. As life passes on from the physical realm, through the transforming karmic Fourth Density, it will be greatly supported by the angelic realm, holding the space and the light as the Fourth Density layer is torn from the Earth. You might imagine they have formed a 'net' around the earth in which to catch wayward souls. If we can help souls to let go of fear and control, then this will greatly help their passage onward into the 5D, rather than to the galactic core. Meanwhile, the 5D New Paradigm will begin to take shape around the foundation stone of the old. In time, the 3D Earth core will settle down, cool, condense, and foster the possibility of 3D life here once more - perhaps millions of years in the future. All of this I have shared in the book DIVINICUS. How much time does humanity have? Firstly I should say that I don't believe my vision to be prophecy. Even though I'm talking of something to take place in the immediate future. I say this because I believe ALREADY an irreversible event line has been initiated - like dominoes knocking themselves over. Various shifts, outlined above, become increasingly inevitable. However, the timing is not set in stone. Mankind actually holds the key to how quickly or slowly this will proceed. If mankind protects the environment, then the window of opportunity can be extended. Currently, humanity's actions are rapidly shortening the life-span of the old reality. Hence it is hard to see beyond the next few decades, for viable existence to continue here on 3D Earth. What this means, is that for those who can hear my message, the time has really come to take your own evolution, your own destiny back into your own hands. The time has come to go inwards and embark on the inner journey of consciousness expansion through the density's - through the 5GATEWAYS - into the Fifth Density - the next chapter of the human story. Tuning into the divine, finding greater inner peace, alignment with the flow of the soul, observing and responding to synchronicity, becoming more as-one with Mother Earth. What you'll find is that attuning to this flow, begins to breakthrough, and carry you through the crucible of change in a most uplifting, empowering and invigorating way: the old layers shed from your reality, and just like the resplendent dragonfly, your new beingness emerges. So what of the souls who don't make it into the New Paradigm? Right now, it is a small minority of beings who have truly committed themselves to the path. In time, many more will likely join as they see the writing on the wall. But still, the majority will likely struggle and strive to bind to the old reality - at least that's the current trend. It means that many will not have the vibrationary level to attain the new consciousness as the window closes. In which case, new existences will become available in other constellations, commensurate with that level of vibration and evolution. Life in the universe works tirelessly towards balanced harmony and alignment in all places - fortunately! So in the course of time, the old reality will be stripped from the Earth as the 5D New Paradigm unfolds itself. I realise this is a great deal to take in and fully digest. But the more you invest in the exploration of your higher, cosmic self, the more obviously possible - and even probable - I believe you'll find my sharing becomes. However, if you keep tuning your consciousness to the limitations of the old reality, then it will continue to seem pretty 'out there' (and you'll keep binding yourself to the old consciousness). Neither do I expect nor wish people to blindly accept or even believe my sharing of what I feel is now set to take place. But you're drawn to my text for a reason. In part maybe you resonate. In which case, I invite you to stay open to the possibility of what I'm sharing. Then to question what you are truly witnessing shaping around you. Be mindful that prior to Enlightenment, you'll be seeing the world through subconscious veils - those of what you'd prefer would happen, or are resistant to what is happening. Be mindful that this will likely be happening to you. And work to feel into your contractions which these veils cause (I've outlined a way of processing inner tightness, density, source pain and karma in this article here...9 step process for dealing with Subconscious Trauma and Karma). It is time to embrace radical, cosmic transformation, of the Earth and dive into the centre stream of your immaculate home coming. All the way into the 5D! Love this article. We have been feeling the shifts over here and are becoming more self sustaining each year. I read somewhere that with Gaia's shift into 5D, there is no support for 3D anymore. I wondered - what does that mean? Yesterday it landed in me with a huge thud. I have never missed a bill payment of any kind for 62 years, and yesterday a forgotten cheque bounced for the first time in my life. We have been riding the Matrix knife edge for awhile now as we work to get our retreat centre up and running. Everywhere that I have turned for funds to keep us going has yielded nothing - and so the downward spiral appeared to me to have begun yesterday with that red number in my bank account. And then the miracle. I saw clearly, perhaps for the first time that we are all One in this - I felt the pain of millions who live daily with debilitating fear gnawing in their gut as they work so hard, day after day, often in soul destroying jobs, to feed the giant beast that has been sucking us dry for so very, very long. I cried and cried - shedding tears for everyone who is stuck, feeling unable to breathe. Then - the breakthrough. A fog lifted and I saw the Matrix for what it is, and how fractured it is. I felt supported from a place, I know not where, deep inside, knowing that if we stay upright, doing our best in each forward step we can't be stopped. The Matrix and all of its control just doesn't matter anymore - we are awesomely okay, no matter what ! I am not 'bad' for bouncing a cheque - I am doing the best that I can. That realization moved me through to a place of trust which is truly supported within the 5th density. With support for 3D gone - it is all we have left. I am not sure that I understand it all yet, perhaps I passed through another Gateway. I am experiencing what it means to let go of it all in full surrender to what wants to happen now. We still have to dance with the Devil as they own all of the resources, but we don't have to feel diminished by it. We can let go of lifetimes of programming which has us desperately doing everything that we can just to be comfortable until the day we die. So, I have put my jaunty tam back on again and am ready to come out of the shadows and do what is being asked of me - facing the beast head on, trusting that I am all that I need. Thanks so much for your sharing Jan. I see you. I feel you. All of these old, out-dated systems like debt and control will slip away with the old 3D reality. How is it right for one person to be able to hoard the resources that belong to us all, and then to lend them back to people at a cost? In the higher paradigm, it's non-sensical. There is a flow. Each partakes of the flow, only to the extent that he or she is able to give. As your capacity to give grows, then so does your capacity to receive in equal measure. There is no need to hoard - this shows lack of trust, therefore control, therefore density. The density itself spins back down to the lower frequency - like being in a washing machine. I know people who've seen such inequity in capitalism and debt, just let the debt slide from their hands and completely transformed their lives. I'm not saying it's necessarily a path for everyone - it depends of course on personal circumstances and the law in that particular place. But it is indicative of an overall shift that wants to happen - IS happening. So hang in there Jan. Keep riding the waves. Feel the truth at each step, then trust in the rightness of the divine. There is so incredibly much in this article! What draws my attention is the old karmic layer of 4D ( kinda like a sponge that has absorbed too much in the 3D) being shifted into the galactic core to break down the density to allow the imminence of light. I've experienced this with souls who have been ripped from their physical shells. About twenty years ago I had a vision that has remained with me. Instead of a net, I saw a web stretched around earth and I saw souls caught. For some earth was all they would ever know. For a very long while I felt an urgency to help in some way to deter that outcome but it's inevitable. Why is earth even a vital aspect to 5D as ascension to higher dimensions evolves? The compassion grows exponentially. The super massive black hole was a visual marvel. In the higher densities "others" are facilitating the shift. Why does it have to stream through individual consciousness to transmute? It seems like once the synergistic effects start to catalyze, the breakdown of consciousness in the lower realm should dissolve and no longer be available as a "radio" station for souls to tune into. I see Gaia to be resilient ready for the challenge and an active player in the ascension that is affecting all life as it encourages the evolution, adaptation, and metamorphosis of the process of transformation into 5D. Yes - an earth shattering process! "Why does it have to stream through individual consciousness to transmute?" I assume you mean through individual people too? It's a good question. It doesn't have to. It can all happen with or without. The Earth could literally tear into the 5D without the majority of people. But we're all interconnected through threads of consciousness. And we're also connected by compassion - of course. So the process will be as mindful and caring as possible. If people can begin to break through the ties and limitations, then it will make the process much easier all round. To me that's the ideal. Not sure if this is what you meant, but it's how I felt to respond. That is what I meant. With the holiday season approaching and consumerism at it's highest, it just all feels very dense right now. This process of self realization is interwoven within every moment, I do have a sense most people aren't involved with being more evolved until it just happens... the earth shattering process. Jan, I love your breakthrough. There is such liberation behind and beyond your words. I send you a big etheric hug. Many thanks Open, for a fascinating, thought provoking & most powerful article. I can feel the energy, passion & enthusiasm you put into it. It's a great work that you are doing, & I am moved to share it with others. So so much in these words you offer, Open. I particularly like the ideas of an abundance of ascension, a cosmic washing machine, and composting the material nightmare. I'm particularly hoping to avoid being fragmented in the galactic core which sounds quite uncomfortable .... although worse things happen at sea, they say. From inside the box of matrix-deep-conditioned ego-intellect this stuff would appear ridiculous, crazy. And indeed is that not exactly what said conditioning does - hide from us the reality of our cosmic situation, the inconceivably awesome possibilities awaiting us, our true destiny. But in the stillness of expanded awareness, where we can be in our innate knowing, there is no mistaking that the process which you so clearly describe is happening and has entered a critical phase (I guess it began eons ago with the first separation of consciousness, the Fall, and this is the inevitable playing-out of the process, aka evolution ? ). My knowing was nodding all the way through reading. This knowing, albeit without the detail, has always been there, if so often obscured from me; the coming armageddon, the pain, the devastation, the promise within it, the sublime, unimaginable, glorious new awaiting us. The challenges facing us are daunting indeed, mankind's crucifixion ? , but oh so good it is to feel the truth that we can ascend. It is ours for the taking. So now it's like Schindler's List for souls, right? We got work to do, friends. Let us give it the urgency it merits. Let us give it our all. keep going you cosmic poet! Your kind words appreciated, buddy. I don't mean to diminish the importance of what is being said in the article. Indeedy ... it could hardly be more important. These things can get the better of us and become depressing. A good chuckle in the face of adversity can be just the ticket. "Always look on the bright side of life ... duh doo ..."
Open, this article is the most comprehensive synthesis of what is going on that I have read to-date. I keep reading and re-reading it, and it works its magic within me day by day, confirming what I have felt and at the same time opening and connecting the dots that I have not yet seen. Oddly enough I have found a jigsaw puzzle site and have been led to use puzzles to sort of visually watch fragmented pieces come together. I don't really ''work'' at it....I'm just led to see where a fragmented piece fits another that fits another that fits a bigger part...it can take days of rather mindless, effortless, but fascinating process. And in the end, voila...a lovely holiday picture. I have also been led to share your article with family and friends and am careful to include the bio etc you have requested. I hope they independently explore the Openhand website. One more thing....I am/was/am once again...an organist. The pipe organ is an instrument that is figuring into this transformation and one particular company, is building such instruments. They literally have harmonics never before heard (as of 12-21-12) and are finding that rather than having the sound decay flat, it decays sharp..an uplift that is lifting the souls who are playing and hearing. Probably my favorite composer for organ is Olivier Messiaen. And my favorite work of his, which I actually had not thought of for years until I read your article. is not an organ work at all. He wrote it while he was imprisoned by the Nazi's in France. A Nazi guard supplied him with paper. Called ''Quartet for the End of Time'', I am hearing it with new meaning for me now, particularly the incredibly beautiful duets between piano and cello, and piano and violin. The entire piece speaks to me musically of what you all have written here...the chaos we are experiencing, as well as the transformation that continues to be birthed within us all. In the midst of the chaos...''Let there be Light''. In a way, we are a new Christmas...Divinicusmas. Just some thoughts... in gratefulness, Love and Light, flooded with quiet joy this morning. Be a lamp unto yourself. the light is already there, the fire is already there. Just probe a little deeper into your being, enquire. Just probe deeper inside, and you will find the spark again. a fire that gives you a new birth and a new being. Shift to 5D - What are your thoughts, considerations, concerns? I'm in Sydney today for a one day Paradigm Shift Intensive, and this process will form a major aspect of what's shared as an experiential journey. It is quite something to get your head around and once you truly begin the inquiry into it, can take some time to integrate. What are your thoughts, considerations, concerns? Thanks for posting this article again today, it somehow seems synchronistic with something I was pondering on today. In the past weeks, in a nearby small urban park with some old trees that are often packed with starlings this time of year, the birds have been dropping dead from the trees in great numbers, I think by now it has reached 250 in just a few days and apparently the park was almost like a crime-scene. So far it seems that they have not been able to find any evidence of poisoning, but the dead birds did have internal bleedings. Some alternative news sources are blaming experiments with 5G connectivity with an antenna on a building just 400 meters away from the park during the same period. And there have also been recent reports of ducks in nearby canals showing strange behavior, all putting their head down in the water at the same time, as if they are trying to dive away from something. As this park and this antenna are not too far from where I live, probably 1-1.5km, this news somehow triggered a lot of emotions, related to the fear of being exposed to something against my will and thus being controlled and powerless, yet at the same time feeling angry. The sense of powerlessness then usually turns into a sense of not wanting to be here on this planet, that there is no use in being here. Intellectually I can reason why my soul is not powerless and that there is a reason for being, but emotionally I still find that hard to digest. The situation also raised a lot of questions about electromagnetic radiation and whether there is anything beyond minimising exposure to it, one can do, because it seems to become more and more difficult these days to get away from it. Even if I switch off all my own sources with electromagnetic fields, there will still be hundreds around me. Is there a way to be right in the midst of all this influence and become 'nothing' in it and thus not get too affected? And if so, how? Your story of the Starlings saddens me too. I'm here in the middle of Sydney, bombarded by seemingly endless invasions of synthetic society energy - it's full on! Either humanity or society is on the brink of implosion! I've been fully awake the last two nights feeling all the electromagnetic radiation and constantly working with it. So what I'm doing is working the Toriodal flow. I feel the internal contraction from the EMF (which is what closes people down), but then constantly work to relax into it and expand around it. So it comes in but has less effect. I also find fasting helps greatly - not to ingest from the surroundings which helps keep consciousness expanded - it's working pretty well so far. We are looking into electromagetic counter measures which I know are possible. As soon as we have something, I'll let people know - if anyone else has suggestions, please do recommend. Its been a couple of years since I met two people who shared with me a lot about their experiences with EMF. One is trading and selling EMF protection devices and the other is a friend who has been severely affected by EMF and has dedicated her life understanding and countering it by any means possible, which includes meditation. Thanks for sharing the Dolores Cannon video! Thank you so much for sharing the Dolores Cannon video. She does a great job of explaining the transition to new earth and why we are here and how we graduateYou have this uncanny ability to answer my questions before they are asked! I was going to email you earlier today because I was looking for new books to read and then you go and post this video and Dolores has a multitude of books on past life regression which is a topic I’ve been very interested in lately. I recently had a past life regression and Dolores touched on a point that has bothered me since the regression; it was great for telling me what happened in a few of my past lives, but what was missing from the regression was the lesson(s) that I needed to learn from them. Ive also been curious about becoming a practitioner, I’m fascinated with the way her process connects to the persons higher self when doing the regression. Yes, I heard of Delore's work a while back before she passed on. And her 'channelings' relate quite accurately to what we're seeing in the Openhand Approach regarding the Shift. I do perceive a crucial difference though in terms of the past life regressions. There are two aspects to karma: the unrealised aspect of soul, and the karmic energy that builds in the field. You can see the energy and remove it during a regression. But if soul (self) realisation hasn't happened, then the karmic situation hasn't been fully processed. Let's clarify here what "self-realisation" really is: it's where the fragment of soul that was stuck in the karmic situation, reconfronts the situation, but rarther than now identifying with the situation (thereby creating the karma), instead it realises the attachment, drops it and realises the One-Self through it. The fragment is retrieved and reconnected into the mainstream of soul. 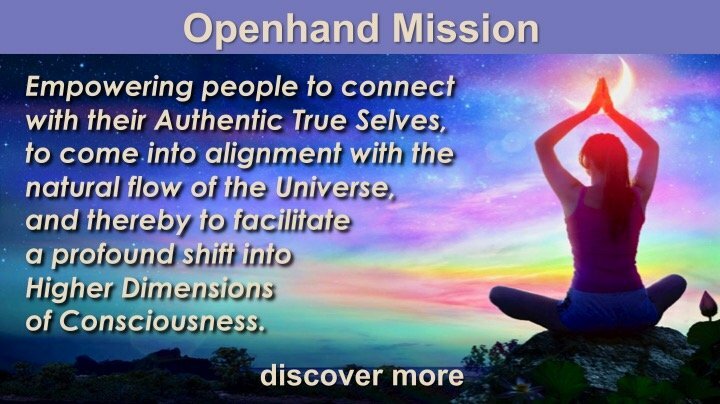 In the Openhand Approach we're doing this all the time - the crucial difference is that we're encouraging people to go through the experiences consciously, to animate the experience so that you feel the full impact again. Thus, in a protected and safe environment, the soul can self-realise through the events and circumstances. Whilst it's not necessary to remember the exact circumstances (in a dream like state), it is absolutely vital that the energy is consciously felt. I always questioned whether this was fully possible when joruneying back through the experiences in the dream-like state. Hence the Openhand Approach in doing it consciously. Yes, it makes sense, thank you for the clarification, I’ll keep that in mind as I continue my research. I think I experienced a bit of this recently. When I went deep into a very disorienting ,intense experience recently ,I felt like previously unowned clear energy came back into circulation . I am as yet unable to make out reasons for karma in terms of story etc. . But I am able to be aware of certain situations triggering deep feelings out of proportion to actual events. When I am able to go into these feelings in their entirety ( sometimes takes several twirls of the spiral and a lot of focus on feelings rather than the story my ego mind makes up) it's almost as if something trapped is released . Is this what you are referring to ? I am able to be aware of certain situations triggering deep feelings out of proportion to actual events. When I am able to go into these feelings in their entirety, it's almost as if something trapped is released . Is this what you are referring to ? I'd like everyone whose following this thread to take note - because karma is described very accurately here in the first line - deep feelings being triggered that are 'out of proportion to the event' itself. That's the point - the inner filter of karma takes a 'normal' situation and then blows up the circumstances out of proportion - because the current event is triggering the past life event. Now the crucial thing is to allow these feelings to flow in full consciousnesss - ie to be fully aware in them. This is where self-realisation then happens. You don't have to know the circumstances the karma is relating to. You just have to process what's coming up. The self-realisation is where the fragment of soul that was stuck on this karmic sediment is now agitating the bed of the karmic stream it is stuck in. It stirs up the sediment inside (which feels like sh**! ), but this is entirely necessary, because the fragment of soul then starts to resonate on the frequency of the mainstream of soul and is reclaimed by it. It 'self-realises'. And now the sediment can wash away. I witness that quite often in the spiritual mainstream people get caught up in the story of "I was the Queen of Sheba", or "I was the King of this"... etc etc. Then it just becomes a self-defeating story that the ego can attach to, instead of processing the energy. So while it can help to know the circumstances that you're regressing into, it is not necessary. The key is processing the energy. As an example ,I react very badly to not being trusted. Also not liked .When I am distrusted or disliked ,a deep wave of self doubt ,then anger ,then grief pushes me into a deep downward spiral. It's actually quite silly when seen from a more objective perspective ,a perspective easily lost. Going into the deep feelings has helped me a lot by unwinding this neural dysfunctional pathway. That's what I understand by karma. And deep exploration reveals all the people and situations that seem to cause it. In reality it's all Me . So the same colleague who is an amazing trigger for my karmic explorations ( I sense I have had many many lives together with this guy ) again triggered me into feeling into the heart centre . This time though I was able to go really deep. I suddenly saw a very beautiful man who I ''saw" was a male version of me - he was likl.a loving masculine aspect of myself and I felt deep love and Grace in his presence . Never had that happen before. Also every time I spiral down this particular rabbit hole ,I seem to micro shift something ,which is great . But there are these two points in my physical heart in which I feel a sharp pain. ( I saw a ?sword going through ) . I am guessing there was a death involved ,perhaps through war or violence. I am not really able to feel into that very much - it hurts so much literally physically that I tend to retract from feeling in to that . Reflections welcome as always ! Hi Megha - the thing that immediately springs to mind is loosing your Twin Flame - loosing the unrealised aspect of yourself in someone else. It can lead to the experience of being betrayed as the other can never fulfill the completion of your own Twin Flame. It happens a lot and perhaps something to explore. Wow! Thanks Megha and Open! I feel for you Jen. When you had something special, there can be that deep sense of loss when they're gone. Yes - this is absolutely crucial. You know it didn't work. But it's easy to see through rose tinted spectacles when you've been apart. So it's important to keep reminding yourself. You may find there are some hooks in some of the lower vehicles that you still need to dig up - perhaps in the emotional body? Or the mind? It's these filters that can activate and write over authentic expression if we're not careful. Be conscious of them. Be determined. Strip the layers away by working into them. One of the things I found was being able to honour the past, yet look forwards. The honouring helps give completion. Just a week ago I was experiencing betrayal in response to a man I know. And it was old karma for sure as I went deep into the pain of what felt like deep disappointment . So it's interesting you use the word betrayal because that's exactly the word that comes up for me frequently even in dealing with this man. It's very deep and energetically strong karma for me too ,Jen . Again ,I seem to have placed myself in a situation in which it would be very very messy to explore this dynamic in the third dimension . And I can easily see how energetically it would never work ,but the karma is there to be worked on in seemingly never ending layers . Phew ! Jen ,I know I have discussed this with you ad nauseum as well - so I hear you and feel you soul sister ! For me the layers seem to have thinned somewhat - It takes me a shorter time to recover from the onslaught of energetic memories now . But this is challenging stuff for sure ! Thank you for that information,Open . I'd like to also share a bit of my story with you as it mirrors yours, and to say you're not alone and I know how hard it can be. I broke a relationship off a year ago with someone who I considered to be extremely compatible. Open would say a close reflection of my twin flame. I broke it off because there was no longer an open emotional sharing going on, and also because she seemed to not have feelings for me any more. The last year has been so hard, not least because I also have to let go of the image of a 'family unit' that I have. Since the breakup we're actually connecting better on almost all levels, including the emotional one. This has caused me to yearn for a full relationship again. And it's also been extremely painful when she's pulled away again and closed off. Jen, like you there remains a feeling that it doesn't work on a 'relationship' level, and yet when I observe how connected we can be, I mourn the times when we aren't. On a more personal note, I have also yearned for the physical aspect. It seems that the hardest parts to let go of are the aspects that I feel have been denied me - ie, the deep feelings, empathy and physical love. In contrast, just last week she admitted that despite still not wanting a relationship, she still had feelings for me. Suddenly I observe the dynamic changing. Suddenly with this insight I no longer yearn for these things any more, though I would still wish to maintain the connection we currently have. Then I ask myself, am I so insecure that I need that safety net of knowing she has feelings, that in some ways I am still wanted? Psshhh, I suprised myself with that one! One thing is for sure - no matter what happens we always seem to have some kind of relationship. Ok so we don't live together, don't often spend time together without the kids, and have no physical intimacy. But it seems to me that the relationship we have is constantly redefined by the moment to moment exploration. So, always new layers are being uncovered and worked through. I think Open's advise of looking ahead is working wonders too. I always said that if I'm in a place between deep grief and anticipatory excitement, then I know I'm exactly where I should be!! This karma stuff eh! Phwerrrr, what did we sign up for?! This has caused me to yearn for a full relationship again. This is totally understandable. Because underneath it all is the desire/authentic yearning, for the divine relationship - ultimately with one's Twin Flame. I recall connecting with someone many moons ago in this incarnation. There was a pretty much instant alchemical connection. And the very human feeling of wanting to connect physically. Yet we were separated by distance. It felt pretty frustrating so I asked "show me!" The flow that day took me into town to a Media store and along the isles until one film jumped right out - Ghost. If you don't know it, it's about a couple being separated by ones death and them trying to form a bridge across the ether. Instantly I got it - my Twin Flame was working to connect through the reflection of this one person. Later that evening, in a phone call to this person, right at the end, she used the word "Ditto" a couple of times, which of course is one of the classic lines from the movie. From that moment I realised there was no need of a physical connection - the completion already happened within. I know it may seem esoteric, but you can absolutely develop an experiential relationship with your Twin Flame. But you do have to work at it. You have to see the reflections in other people, but keep reminding yourself the completion is back at the source within. I remember from that point making a conscious connection wherever I went. Even if I went out in town for a meal on my own, I'd set the place opposite for my Twin Flame. It's amazing how the reflections can build, until you feel like you're in relationship - you are - the ultimate one! And when you do then connect with another in the physical sense, it means you can give much more of yourself, but without attachment. It sets them free too. Thanks so much for sharing your story Rich. I can relate to so much of it. Me and my former partner also parted over a year ago, though recent formal legal papers has tripped some of my deepest fears. Yes, I too can relate to letting go of the idea of family unit - that still challenges me to a degree. He and I have been friends since long before we were married and I am grateful that still remains. The fears that have been coming up are related to being replaced, no longer being someone's important someone, and never experiencing a loving, intimate relationship again. Lately I have witnessed how I might unconsciously manipulate to make myself feel more secure and avoid feeling the loss. It's not a pretty thing to see about myself! I know I need to confront the fears I have of losing him as "my person" and how it will feel when he moves on with someone else. Otherwise, I am kinda of trapped in a fragment of the past where everything becomes motivated by avoiding that feeling and not really being free to be in the flow. I have realized that I am not letting myself look forward either - because that requires me to face the potentials that I fear. The untethered potential futures before me can be unnerving. I notice I have some fears around potential intimate relationships of my own in the future. In reading back at Open's reply, I wanted to add that I feel some sense of mistrust around the twin flame experience - either that it's not real or that it's not possible for me. It's something about doubting my worth and feeling abandoned that causes me to remain in some state of disbelief even though I also feel the truth in what you share about it Open. I feel like the distrust causes me to cling to the physical relationship somewhat. Being a messenger but not heard? So what I get to reflect to you Megha, is to take some time and explore into being a messenger, with an important message, in a particular past life reality (probably another constellation), where you share the message but its not listened to. Which then turns into self-doubt and a loss of trust in those working with you - leading to a loss of trust in your own intuition. I get something along these lines to inquire into. I confess that whenever the conversation veers to other planets ,I often am unable to feel much connection . The first word that popped up when you said past lives was 'Sirius' . And definitely ,I was a messenger. And wasn't heard. And bow ,given the state of this planet ,it's achingoy heart breakingly similar . So much denial . So deep is the refusal to see what seems plainly obvious to me. Also this ties in very well with my deep feeling of unbelonging. Any suggestions for meditations to help me access ? Well I studiously avoided mentioning Sirius, but that's the constellation that was given through the ether. When things like this start to activate, the key is to witness how the particular circumstance might be arising in daily life - what are the patterns connecting circumstances and events together? I have been reading a lot about the Sirius archetype. Like I said earlier ,it seemed quite alien to me( pun intended 😀) but now I can see how it relates to the disorientation I feel in presence of a colleague . So when we are talking for even a few minutes all my chakras turn on at once and then I have seen several times a symbol of a triangle but with rounded edges and interrupted sides. I ' see' this in his heart centre and a similar one appears on my own . I also get this really strong feeling we were on mission together and then he forgot and feel quite a lot of anger and frustration at him too. When you talk about boundaries and soul sovereignty ,I have worked very hard on them. I continually am vigilant about them even in my most intimate relationships. With this guy ,they seem to fly out the window. Somehow I feel that's related to Sirius . I was on a ship somewhere in space is what I see again and again. I will.confess I have always rubbished these images as some crazy science fiction stuff that my imagination has conjured. As a young adult I literally devoured all the science fiction there ever was. Far off galaxies made much more sense to me than my waking reality at that point. I am still figuring out how to integrate this . I have been feeling into these feelings for about four years now ( maybe that's when the karma activated ?) but it's only after you said Sirius that several other things made.sense . For some reason I'm actually afraid to press publish on this sharing . I am doing chakra meditation more.frequently now . Do let me know what you think . Interestingly you were afraid to publish and it published twice! (so you were clearly meant to). So what were you afraid of? Have you read Divinicus? It shares a perspective on how plenty of us went to Sirius with the mission of sharing the message of the dramatic ascension and breakdown of the reality which had already been initiated. Yet the messages were misunderstood or else rejected. And plenty misunderstood the advice on how to process out karma. So in short, the shift turned out to be a helluva mess! A lot of light workers I know carry the sense of responsibility and burden for that. A deep healing is necessary - hence many find themselves here on Earth essentially reliving the same thing again but in a different way. Maybe the guy you talk of is soul family - hence the resonance of vibration and the potential for boundaries to be crossed. I suggest you keep exploring and keep working with what comes up. It's a big story for sure. I just wanted to share with you that when I read your inquiry here about being some kind of messenger, my instant thought was ‘Sirius’ as well, before you mentioned the word yourself. I have had visions/memories of what I suspect is Sirius and what happened there, and when I read about your challenge it touched something in me that resonated. I’m also seeing that our paths on the Openhand forum keep crossing, so perhaps there is a common thread here wanting to be explored. Without going into too much detail, my visions involve being part of a team in a laboratory, working and experimenting with blue light energy. We could shape and ‘bend’ this energy with our hands and our sense of will. The work was being supervised by this patriarchal figure entering the room from time to time, and hovering over us. We were in much lighter, almost translucent bodies, and the gravity wasn’t as heavy. I was able to propel myself into the air and move around up there without immediately being pulled back down. At one point, I broke away from my team and sought a place where I was completely alone. I carried a secret between my hands that I didn’t want anyone to see. Once in solitude, I opened my hands and witnessed something very worrying. A part of the energy I had been working with was going haywire. It was bouncing back and forth between my hands and I could no longer fully control it. It felt volatile. And here comes my issue - I knew I had detected an anomaly in this energy, that could potentially be very dangerous, and I knew I was probably the only one who had seen this, as everyone else just seemed to go about their usual business. You’d think, I would go and tell someone about my discovery, but that’s exactly what I didn’t do. I didn’t know whom to trust, especially not the patriarchal ‘supervisor’. I was too afraid of the information falling into the wrong hands, as I saw how potentially dangerous this was. So I ended up keeping it to myself, waiting for others to discover it, which they eventually did, but by then it was too late. So in my case, I carry the burden of being given an important message to deliver but choosing not to, out of fear and doubt. I don’t know if sharing what I knew would have made a difference in the end, but the fact that it might have, weighs heavily on my heart. As a karmic theme this has followed me around this lifetime. I often see things before other people do, or I see energies under the surface other people don’t. Up until now I never really had the confidence to speak up. I often kept the information to myself thinking I must be wrong, waiting for someone else to see it and speak first, or sometimes mustering up tons of courage to say something, only to be immediately dismissed and not daring to speak again. It’s one of my life’s challenges - moral courage. It’s become a conscious practice for me now - dare to share no matter the outcome. And still, every time I share something here, there is this little hump of resistance I need to get over before posting. I came across something that may be useful for protection from emf when I was researching awhile ago. Its ORGONITE. It can be made by anyone or purchased. Check it out, worth a look! i hope the info helps. ps. Megha I so relate to your sharings re sci fi etc. thankyou for putting it out there! So appreciated. It warms my heart to hear that you feel encouraged. I was petrified the first time I shared here. It took me like a week of writing and rewriting before I finally dared to let it out there. Wishing you well and looking forward to ‘seeing’ a lot more of you here on the forum. I am so amazed and enthralled by the fact that the group energy on this website shifts so much so quickly for everyone. I am so glad that my authentic heart sharings have spoken to you. It's often very hard for me to share too - even to my ears it seems ludicrous sometimes. But we are trying to go from conditioned linearity into unconditional non linearity ,so just flow with whatever is arising for you . Big heartfelt love to you . This is such an exciting phase of life for us all. Challenging and deeply alive times.these are . Warm hugs through the ether ! I am fairly new to this journey and have only just touched the surface of karma processing etc. I see the writing on the wall with the unwinding of 3D, that there isnt much time left to process all my karma before Gaia moves completely into 5D. To be honest, I feel very grieved as I dont think I will have done enough inner work and wont be able to move on with her. I love Gaia so deeply and want to stay with her on her journey. I guess I will just have to come to terms with it, its hard and it brings me to tears. I feel like I would be losing a very close friend. I think plenty of people feel this way - the sense of time running out. But actually if you're on the journey, there's still plenty of time to process karma, and the various shifts will help that. Plus really it's about the journey, not the destination. New opportunities and possibilities will manifest to be able to evolve as a soul - it's continual. Sending loving support you way. thanks so much for the reminder! Thanks for such a warm welcome from you both, it feels oh so good! Big hugs to you. And for your loving support and insight Open, much appreciated. What a fab bunch of peeps on this site, I am truly grateful. Just wishing you well Zee ! Lots of etheric hugs !